Garden Sculptures — Which is Right for You? Are you looking for something special to accent your yard? Garden sculptures are a lovely way to beautify your Minnesota landscape. There is a wide range of options available, so let’s take an in-depth look at all of the options available in garden sculptures and how they differ. The ability to stand up to the elements is vital so it would be wise to select a material that will provide long-lasting beauty. While wood is often regarded as highly attractive, it should be treated regularly with an effective sealer. Some sculptures can be custom made or homemade. It is possible to have one specially designed for your garden. There are even extreme cases of individuals who create lovely sculptures out of what some may consider junk. This typically involves the use of such objects as copper tubing, wood, glass or mosaic tiles. Angels and cherubs are frequently chosen to enhance gardens, while others prefer more lifelike or realistic sculptures such as those that resemble animals. For the art lover with refined tastes, there are even weather-resistant reproductions of such classics as Rodin’s “The Thinker.” Whatever your tastes happen to be you can usually find a wide assortment of sculptures in specialty shops and nurseries. Shopping online may even yield brilliant results. And of course, the creative professionals at Architectural Landscape Design can be counted on to provide help in the area as well. 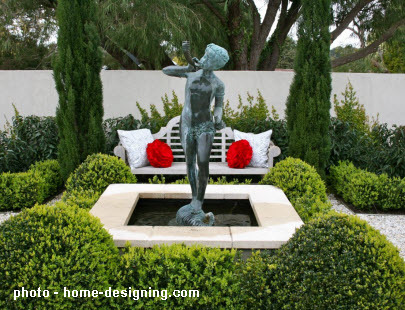 We specialize in unique garden design, and we can help you find precisely the right sculpture style to highlight your lovely Minnesota landscape. For some garden sculpture inspiration, visit us on Pinterest.